A bit of a delay but here comes the rain rally. Home > Cattle > A bit of a delay but here comes the rain rally. 09 Mar A bit of a delay but here comes the rain rally. It rained last week, and it’s going to rain in the dry areas. By the end of next week the whole of Queensland will be wet. Parts which haven’t been wet for five years will be wet. It’s been long awaited, but finally we have seen enough rain to give the market a bit of upward momentum. In the young cattle space the market finally turned. It’s been eight weeks of gradual easing, but this week demand picked up and the Eastern Young Cattle Indicator gained 17.75¢ to 539¢/kg cwt (figure 1). Interestingly, EYCI yardings were actually higher, which is a tell-tale sign of stronger demand. Despite the rally, figure 1 shows us that young cattle are still pretty cheap relative to the last two years at this time. Most cattle categories gained ground this week as overall cattle yardings dropped back towards more normal levels. Cow and Heavy Steer prices picked up slightly, but remain stuck in the narrow range they’ve been trading at so far in 2018 (figure 2). There was one indicator which caught our eye. Restocker steers in Victoria were priced at just 232¢/kg cwt. A whopping 143¢ lower than this time last year, and 100¢ below the national average restocker steer. It was probably on very small numbers, but someone got a bargain. Things were fairly steady in the west, the WYCI at 579¢/kg cwt maintaining its premium to the east coast market. Recent rain in the west might see further upside, but the 90CL price at 600¢ suggests upside is limited. Over the last 12 months Western Queensland’s rainfall has been in the ‘very much below average’ decile. In figures its rainfall has been 100-400mm below average. Figure 3 shows that in some parts at least, the rainfall deficit will be rectified over the coming week. 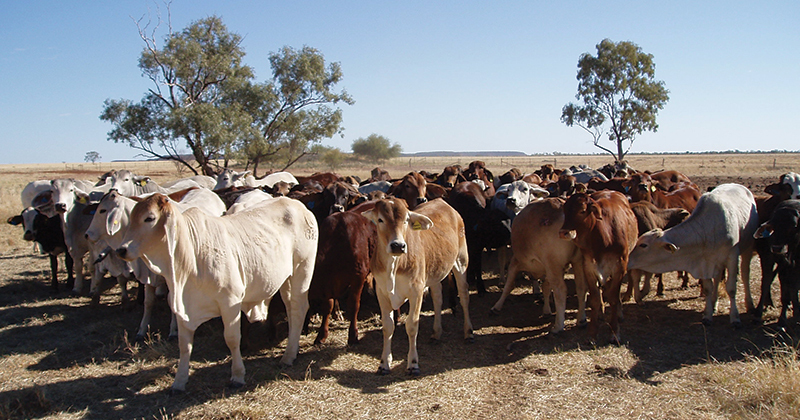 We know grass doesn’t appear instantly, and neither does demand, but there aren’t going to be many cattle coming out of Western Queensland for a while.